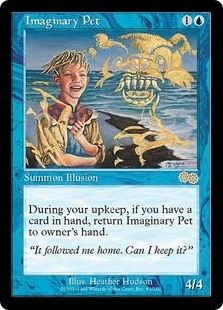 Imaginary Pet ($0.25) Price History from major stores - Urzas Saga - MTGPrice.com Values for Ebay, Amazon and hobby stores! Card Text: At the beginning of your upkeep, if you have a card in hand, return Imaginary Pet to its owner's hand. Flavor Text: "It followed me home. Can I keep it?"